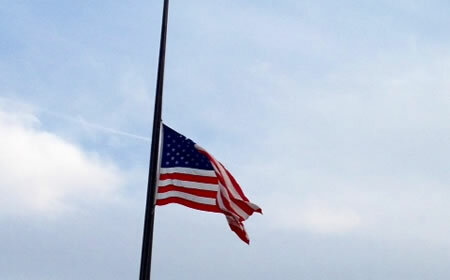 President Barack Obama has ordered the United States Flag to be lowered to half staff effective today, Feb. 14, and returned to full-staff at sunset on the day of internment. This is in honor of Associate Justice of the Supreme Court Antonin Scalia, who died on Feb. 13th. As a matter of protocol, the Maryland Flag is lowered to full staff as well. No flag may be higher than the United States Flag.